With summer rapidly approaching we are spending more and more time outside. 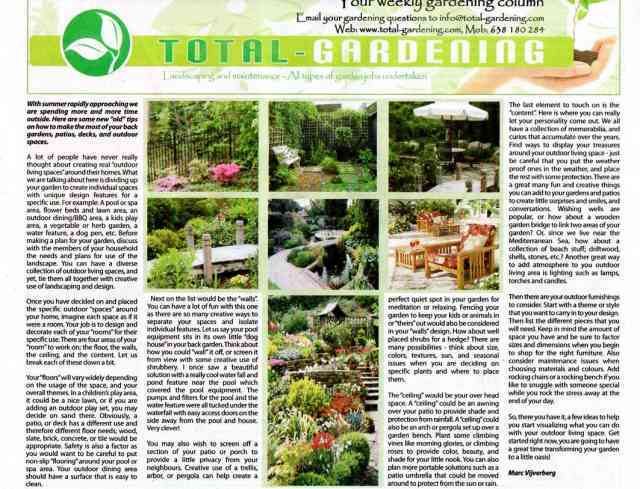 Here are some new �old� tips on how to make the most of your back gardens, patios, decks, and outdoor spaces. A lot of people have never really thought about creating real �outdoor living spaces� around their homes. 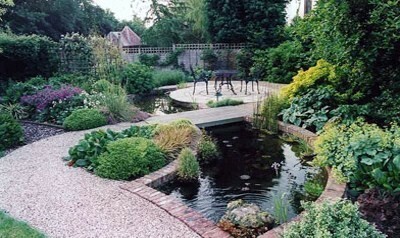 What we are talking about here is dividing up your garden to create individual spaces with unique design features for a specific use. For example: A pool or spa area, flower beds and lawn area, an outdoor dining/BBQ area, a kids play area, a vegetable or herb garden, a water feature, a dog pen, etc. 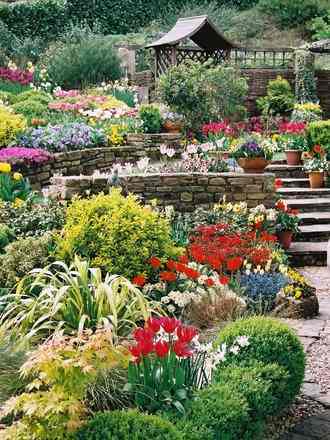 Before making a plan for your garden, discuss with the members of your household the needs and plans for use of the landscape. You can have a diverse collection of outdoor living spaces, and yet, tie them all together with creative use of landscaping and design. Once you have decided on and placed the specific outdoor �spaces� around your home, imagine each space as if it were a room. Your job is to design and decorate each of your �rooms� for their specific use. There are four areas of your �room� to work on; the floor, the walls, the ceiling, and the content. Let us break each of these down a bit. Your �floors� will vary widely depending on the usage of the space, and your overall themes. In a children�s play area, it could be a nice lawn, or if you are adding an outdoor play set, you may decide on sand there. Obviously, a patio, or deck has a different use and therefore different floor needs; wood, slate, brick, concrete, or tile would be appropriate. Safety is also a factor as you would want to be careful to put non-slip �flooring� around your pool or spa area. Your outdoor dining area should have a surface that is easy to clean. Next on the list would be the �walls�. You can have a lot of fun with this one as there are so many creative ways to separate your spaces and isolate individual features. Let us say your pool equipment sits in its own little �dog house� in your back garden. Think about how you could �wall� it off, or screen it from view with some creative use of shrubbery. I once saw a beautiful solution with a really cool water fall and pond feature near the pool which covered the pool equipment. The pumps and filters for the pool and the water feature were all tucked under the waterfall with easy access doors on the side away from the pool and house. You may also wish to screen off a section of your patio or porch to provide a little privacy from your neighbours. 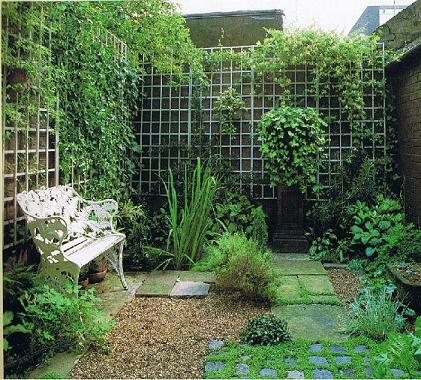 Creative use of a trellis, arbor, or pergola can help create aperfect quiet spot in your garden for meditation or relaxing. Fencing your garden to keep your kids or animals in or �theirs� out would also be considered in your �walls� design. How about well placed shrubs for a hedge? There are many possibilities - think about size, colors, textures, sun, and seasonal issues when you are deciding on specific plants and where to place them. The �ceiling� would be your over head space. A �ceiling� could be an awning over your patio to provide shade and protection from rainfall. A �ceiling� could also be an arch or pergola set up over a garden bench. Plant some climbing vines like morning glories, or climbing roses to provide color, beauty, and shade for your little nook. You can also plan more portable solutions such as a patio umbrella that could be moved around to protect from the sun or rain. The last element to touch on is the �content�. Here is where you can really let your personality come out. We all have a collection of memorabilia, and curios that accumulate over the years. Find ways to display your treasures around your outdoor living space - just be careful that you put the weather proof ones in the weather, and place the rest with some protection. There are a great many fun and creative things you can add to your gardens and patios to create little surprises and smiles, and conversations. 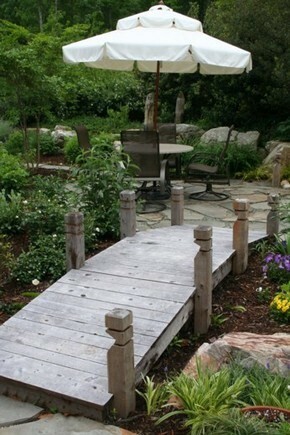 Wishing wells are popular, or how about a wooden garden bridge to link two areas of your garden? Or, since we live near the Mediterranean Sea, how about a collection of beach stuff; driftwood, shells, stones, etc.? Another great way to add atmosphere to you outdoor living area is lighting such as lamps, torches and candles. 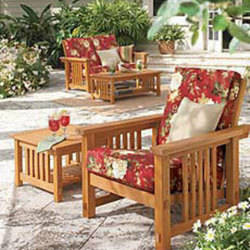 Then there are your outdoor furnishings to consider. Start with a theme or style that you want to carry in to your design. Then list the different pieces that you will need. Keep in mind the amount of space you have and be sure to factor sizes and dimensions when you begin to shop for the right furniture. Also consider maintenance issues when choosing materials and colours. Add rocking chairs or a rocking bench if you like to snuggle with someone special while you rock the stress away at the end of your day. So, there you have it, a few ideas to help you start visualizing what you can do with your outdoor living space. Get started right now, you are going to have a great time transforming your garden to a little oasis!